Back in June, we brought you the John Carpenter’s ‘The Thing’ at Lighthouse Cinema starring Kurt Russell. On 23rd September, they’re back on the big screen again with ‘Big Trouble in Little China’! Kurt Russell plays hardened trucker Jack Burton, a man who believes he’s born ready for action, but quickly finds himself way in over his head when he gets caught up in a centuries old conflict in the heart of San Francisco’s Chinatown. After the fiancée of Jack’s best friend gets kidnapped, Jack soon finds himself entering a world of deadly ninja assassins, monsters and, behind it all, an evil ancient sorcerer known as Lo Pan. 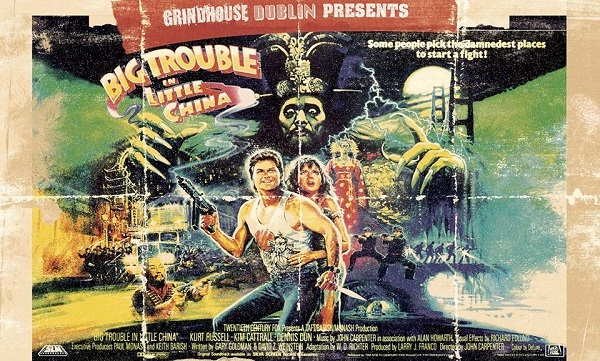 Big Trouble in Little China will be shown at Lighthouse Cinema, Smithfield on Friday September 23rdst at 10.30pm!